Our Slow Feeder Saver is designed to give Equine the healthiest and most natural eating experience possible regardless of them being stalled or stabled. Slow Feeding is proven to improve the digestive process, which leads to better overall Equine health. Places the horse in a natural anatomic feeding position producing better conformation and less stress on their joints. Ruggedly constructed from 600D polyester, this hay bag features a slow feed design that promotes slower feed consumption for better digestion. The slow feed method also helps to alleviate boredom as well as reduce hay waste. Great for use in stalls and trailers, this design easily hangs from adjustable, detachable straps. 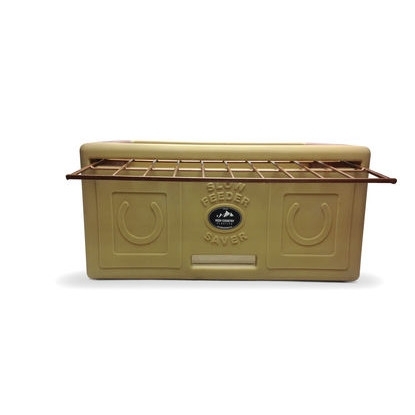 Top loading bag holds two average-size flakes of hay perfect for use at both home and at horse shows. Mesh bottom for ventilation. Measures 25" W x 18-1/2" H with an 11-1/2" top opening. Black. Lined with neoprene for added comfort, this black nylon and rubber grazing muzzle features a vegetable tanned leather double buckle crown. Helps limit grass intake for horses on a diet or that are prone to founder and colic. Large size. Lined with neoprene for added comfort, this black nylon and rubber grazing muzzle features a vegetable tanned leather double buckle crown. Helps limit grass intake for horses on a diet or that are prone to founder and colic. Average size. Lined with neoprene for added comfort, this black nylon and rubber grazing muzzle features a vegetable tanned leather double buckle crown. Helps limit grass intake for horses on a diet or that are prone to founder and colic. Small size. Lined with neoprene for added comfort, this black nylon and rubber grazing muzzle features a vegetable tanned leather double buckle crown. Helps limit grass intake for horses on a diet or that are prone to founder and colic. X-Small size. This polyester corner feeder with mesh bottom is perfect for holding grain in stalls and trailers. Features three grommets with snaps for easy attachment. Measures 25" x 25" x 20" x 11-1/2" H.
Our economical, weather-resistant PVC mesh feed bag features a webbing strap with a black plastic slide buckle for easy adjustment. The fine mesh keeps grain in while providing ventilation for the horse.